The Proton launch vehicle that lifted off from at the Baikonur Cosmodrome on Sunday, 13 December, at 3hr 19min a.m. Moscow time successfully placed a Russian military spacecraft into orbit. 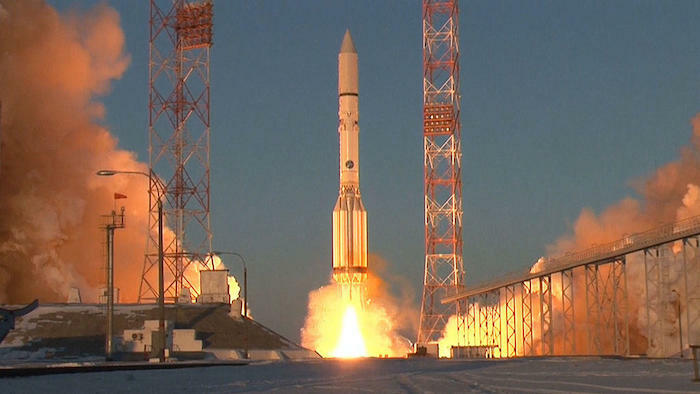 This marks the seventh Proton launch of the year. The lift-off and flight of the Proton M launch vehicle were nominal. The Orbital Unit (the spacecraft and the Breeze M upper stage) separated from the third stage of the rocket at expected time, and continued its autonomous flight. Further injection of the spacecraft into the target orbit was performed using ignitions of the upper stage main engine. The spacecraft separated from the Breeze M upper stage at expected time, and was taken under control by the Titov Main Test Space Center of the Russian Air and Space Forces. The heavy-lift Proton launch vehicle and the Breeze M upper stage are developed and serially manufactured by the Khrunichev Space Production and Research Center. The heavy-lift Proton launch vehicle is used to launch payloads into Earth orbits and escape trajectories as part of federal and commercial missions. It is notable for its high performance and operational characteristics. An enhanced Proton M equipped with the Breeze M upper stage is capable of lifting payloads of more than 6MT into the GTO.